Hampshire will review their coaching structure at the end of the season following the departure of Dale Benkenstein as head coach. Benkenstein left the county by mutual consent on Saturday to return to his native South Africa for family reasons. 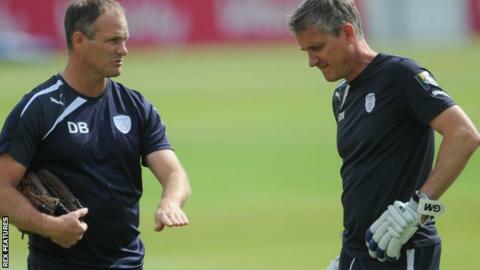 Director of cricket Giles White and assistant coach Craig White will assume first-team duties until the winter. "We've got a lot of important cricket ahead between now and the end of September," Giles White told BBC Sport. "I will become closer to the day-to-day running of the team and (former Yorkshire and England all-rounder) Craig White will fill the void left by Dale." Hampshire sit bottom of County Championship Division One and are unable to reach the T20 Blast quarter-finals, but they still have a chance of making the last eight of the One-Day Cup. Added to a number of injuries to key players, batsman Michael Carberry has been diagnosed with cancer. Speaking to BBC South Today, Giles White admitted: "It's been a challenging year for a number of reasons. "But this team has shown a lot of spirit over the last couple of years and we'll need that again with lots to play for. "In the close season, we will look at how we structure the coaching staff. For now, it's about the next game and from then on, the rest of the season."